In the photograph here I am the beardie reading the news on the right hand side of the desk. I learnt many skills at Radio Brighton thanks to Bob Gunnell and his news editor Bud Evans in what was my first job in broadcasting after newspapers. When I started, Radio Brighton used the 24-hour clock; it sometimes confused listeners and we had to correct contributors live on air. But it did show how continental we were by the sea. We also had a fantastic Heath Robinson tape pulley system in the main studio, so we could delay the start of the Radio 4 news bulletin on a loop of tape until we finished the local headlines and someone pressed ‘play’. If the presenter wasn’t quick enough, the studio assistant had to grab a spool on a pulley, take up the slack and run across the room with it. 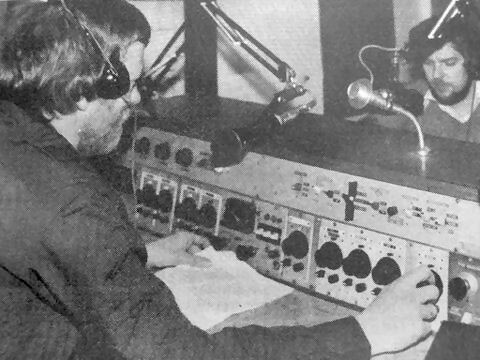 At the controls in the picture is the now sadly departed freelance Brian Deacon who was discovered (by me) doing a kids’ hospital radio show in Worthing. I sometimes pass the current Brighton studio, but can’t imagine it can all possibly be as much fun as it was in those maverick times. Looking back, you started with the local audience and basically did more or less what you wanted until local radio HQ told you to stop. Sometimes the results were quaint- like those broadcasting bus controllers. But when the Athina B ran aground between the piers, when a Red Arrow crashed or the Brighton Marina first opened, we were there. Happy Days. Do you remember Radio Brighton. Who were the presenters and what sort of shows were on there? If you can, share your memories of those early days by posting a comment below. I remember in 1980, Radio Brighton had an auction on the radio and I gave them a hand knitted Aran sweater which they sold for £20. The auction was to raise money for a charity like Help the Aged. I seem to remember being part of the very small studio audience on a Saturday morning show ‘Cabbage and Kings’ – I think that’s the name of the show. Very exciting for an eleven year old!